The day my dream came true -- literally! All through the first half of the concert, I still had the feeling of the two sequins pressing into my fingers on the back of her dress. I just could not believe it. I had been that close to Dolly Parton herself. I was also still in a bit of a shock. I had gotten to my seat just in time before the lights went down and the prelude began. 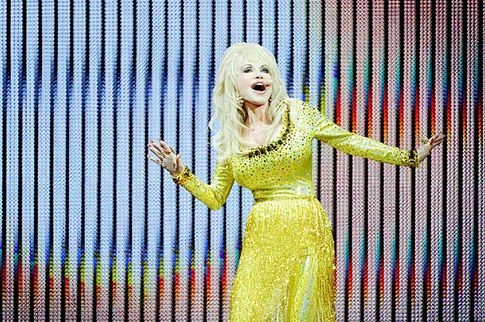 Behind the curtain, Dolly's voice rang out. "I can see the light of the clear blue morning...I can see the light of a brand new day...." Slowly and surely, her voice was ever-present. A hush fell over the crowd and everyone stared at the darkness and where they knew the stage and the curtains stood closed. Suddenly, the curtains slowly opened to reveal a certain and familiar figure on stage. Lights quickly rose up and ended out blasting the crowd and indulging everyone in light! 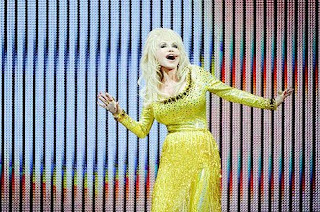 Playing the fiddle, Dolly bursts out! And before putting the fiddle down and breaking into "I'm walking on sunshine!" She gave a warm, "Helllloooo, Stockholm!!" I stood up just then and waved up at her when she came near. I heard her say, "Why, hello there!" Did she see me down there? Kind of hard to tell. She is so professional! And amazing! I was just overjoyed at seeing her there myself. She seemed to look straight at me sometimes all during the concert. And, when in the beginning, she talked about how there weren't a whole lot of people here in Sweden but there were a few who said thank you for coming last time, she was looking straight at me then. I gave her a slight gesture of "yes, Dolly, I was one of them who said a thank you." I don't know if she saw. But who knows. May be. I was close enough for her to see! The connection she has with her audience! And that night she seemed to have something special with me too! I become inspired by indulging myself in something. Then I have to write and do my artwork accordingly. That is how I work.